Thisstory was updated at 5:35 p.m. EST. NASA?splanned launch of the space shuttle Discovery this month has slipped a few moredays to Feb. 22 due to extra time needed to finish tests related to newly installed valveson the spacecraft, agency officials said Friday. Discoverywas slated to launch no earlier than Feb. 19 pending the completion of tests toensure the shuttle?s three fuel flow control valves are safe to fly. But workat several NASA centers to evaluate the valves in time for a Tuesday meeting byshuttle managers is taking longer than planned, and shifted the launch to noearlier than Feb. 22, according to an update released late Friday. Missionmanagers are now expected to discuss the valve test results on Feb. 13, andthen meet again on Feb. 18 to review the Feb. 22 launch target, said NASA spokesperson Kyle Herring at the agency?s Johnson SpaceCenter in Houston. That process, however, is wholly dependent on the progressand results of the valve tests, he added. Earlierthis week, NASA delayed Discovery?sinitial Feb. 12 launch date by at least a week due to concerns with thespacecraft?s flow control valves. There arethree flow control valves on Discovery - one for each main engine - designed toroute gaseous hydrogen from the engines to a propellant tank in the orbiter?sexternal tank to maintain proper pressurization during the launch into space. 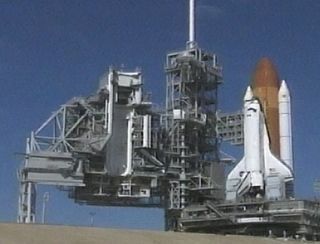 DuringNASA?s lastspace shuttle launch in November, one of the valves aboard the Endeavourorbiter was damaged, sending a small chip about the size of a thumbnail tipinto the plumbing lines leading back to the external tank. Endeavoursuccessfully reached orbit and maintained fuel tank pressure despite theglitch. Engineers found a crack in the suspect valve after Endeavour returnedto Earth. An initialanalysis suggests that acoustic vibrations may have led to high-cycle fatigue ofa valve component that pops up and down like a lawn sprinkler head, NASA?sspace shuttle program manager John Shannon told reporters late Tuesday. Similarvalves aboard Discovery were replaced with ones that have flown previously andare known to be in good shape, he added. Even so,mission managers ordered a round of tests to better understand how metallicchips from the valves could affect plumbing lines leading back into Discovery?sfuel tank during flight. "Wewant to make sure we've got this right,? said NASA?s space operations chief Bill Gerstenmaier lateTuesday. ?So we think standing down a little bit of time, and letting thefolks do a little more work is a good thing." Commandedby veteran spaceflyerLee Archambault,Discovery?s STS-119 mission is NASA?s first of up to six shuttle flightsscheduled for 2009. The two-week mission includes four spacewalks to deliverthe last set of U.S.-builtsolar arrays to the International Space Station and replace a member of theorbiting laboratory?s Expedition 18 crew. A series ofadditional space station construction flights, as well the final shuttlemission to overhaulthe Hubble Space Telescope, are also slated to launch this year.